It causes intense pain, cramping, nausea, headache, fatigue, and excessive blood flow. It affects 10% of women in the U.S. and costs the nation over $100 billion annually. Many women suffer in silence; many don’t even know they have it. This hidden disorder is called endometriosis. Endometriosis impacts at least 176 million women world-wide, with many women not being included because of lack of diagnosis. The $119 billion cost estimate assumes 10% occurrence rate of endometriosis among women of reproductive age. This painful disorder causes women to lose, on average, 10 hours of work per week, according to a study on lost workplace productivity. Women are also oftentimes misdiagnosed, resulting in delayed treatment, some for decades. 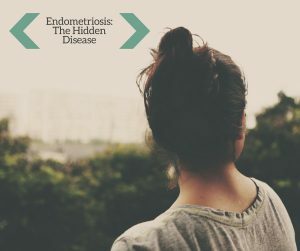 Endometriosis occurs when uterine tissue grows outside the uterus, oftentimes causing severe pain, especially before and during a woman’s menstrual cycle. Endometriosis can first occur when girls first get their period, and causes symptoms during a woman’s reproductive years. Lack of funding, research and awareness surrounding endometriosis are key issues. Physicians, experts and celebrities are speaking out, including actresses Lena Dunham, Susan Sarandon and Whoopi Goldberg, who have shared their personal stories about struggling with this condition. Celebrities who have suffered from endometriosis: Jillian Michaels, Whoopi Goldberg, Marilyn Monroe, Pamela Anderson, Dolly Parton, Cyndi Lauper. While some people believe pregnancy or a hysterectomy cures endometriosis, no cure currently exists for endometriosis. Women might experience decreased symptoms during pregnancy because of more progesterone in the body. For people who don’t understand endometriosis, a stigma lingers about the disease, and it’s written off as simply bad periods. Unfortunately, even when women seek treatment, they are often misdiagnosed leading to unnecessary and inappropriate treatment. CTs, MRIs, or even ultrasounds cannot be used to detect it. Pelvic exams can indicate signs of endometriosis but cannot confirm it. In fact, no test exists for endometriosis, so patients cannot be tested to confirm the disease. The only way to verify endometriosis is to undergo a diagnostic surgery.